Want To Protect Your Enamel? Tips From a Dentist in North Dallas! Did you know that sharks, crocodiles and kangaroos are just some of the animals that get replacement teeth throughout their lives? Unfortunately, we humans don’t share that trait and get only one set of adult teeth that have to last 90-100 years. That means it’s especially important to take care of the ones you have! But what’s the best way to do that? A good place to start is by protecting your enamel; the hard, protective outer layer of your teeth. The more your enamel stays intact, the less dental work you’ll need from a dentist in North Dallas. Learn more below! Why Is Your Enamel So Important? Enamel is the hardest substance in the body – even harder than your bones. It protects the inner layers of your teeth where the nerve resides and allows you to comfortably eat a wide variety of foods with different textures and temperatures. Unfortunately, that doesn’t mean enamel is indestructible! Just like stone and marble can be worn away by acid rain, your teeth are also subject to wear-and-tear, which is called enamel erosion. Acidic foods – Enamel erosion can be caused by eating a lot of citrus fruits or other acidic foods. Gastroesophageal reflux disease (GERD) – If your teeth are exposed to a lot of stomach acid, your enamel can be worn away over time. Pregnancy – Since one symptom of pregnancy is acid reflux, pregnant women can also experience enamel erosion. Soda and carbonated beverages – Even carbonated water and diet sodas have carbonic acid that is harmful to your enamel. Sugar – Consuming sugary foods and beverages results in acid production that damages your enamel and can cause cavities. How Can You Maintain Healthy Enamel? Schedule regular checkups – Routine dental care is a great way to keep your enamel healthy. In addition to having plaque and tartar removed, you also have a dentist closely monitoring your teeth every six months. 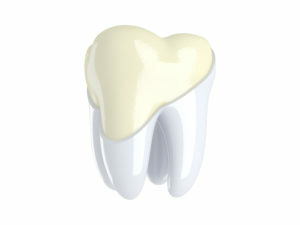 That way, any enamel erosion can be treated when it’s still minor. Chew sugar-free gum– If you’ve eaten something acidic or sugary and aren’t able to brush right away, chewing sugar-free gum will reduce the impact on your teeth. It stimulates salivary flow, which washes away plaque and food debris, and also neutralizes acids. If you don’t have sugar-free gum, simply swishing with water several times can also be helpful. Use fluoride – In addition to the fluoride that’s in your toothpaste, using a fluoride mouthwash 1-2 times a day is a great way to add mineral back into your enamel and keep it strong and healthy. With these basic tips for maintaining your enamel, you can count on great oral health for many decades! Dr. Dale Greer is an award-winning general, cosmetic and restorative dentist with over 40 years of experience. He knows that any time spent on prevention efforts is time well spent because it minimizes the amount of dental work his patients need over the long-term. If you have any questions he can be reached via his website or at (972) 233-4546. Comments Off on Want To Protect Your Enamel? Tips From a Dentist in North Dallas!